Despite their large size, trestle tables are easy to move. This is because the joints connecting the feet to the legs, the legs to the rails, and the rails to the top are fixed not by glue, but by screws and bolts. 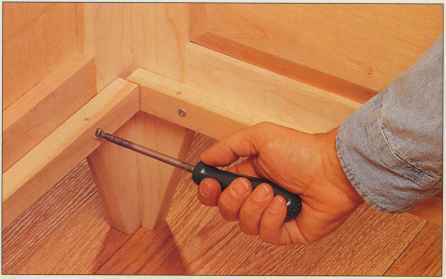 The table shown below relies heavily on knockdown hardware, a modern version of the Shaker practice of assembling tables with bolts that drew against a trapped nut, allowing easy disassembly. Shakers frequently used cherry for their tables; this remains a good choice today. To prevent the top from warping and also to hide end grain, a tongue is cut along each end to position the mating groove of a breadboard end. The ends are screwed to the top, with only a little glue applied at the middle. This allows the top to expand and contract across its width as humidity changes without being hindered by the breadboard ends. 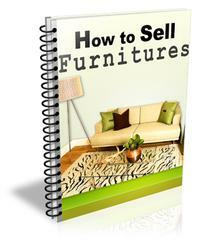 As shown on page 59, the first step in making this table is gluing up the top. Because of its width, the top cannot be passed through most thickness planers after glue up. Instead, start by assembling the top in the largest possible sections that your machine can handle and plane them to a uniform thickness. Then glue the sections together, being very careful to ensure that they are perfectly flush. 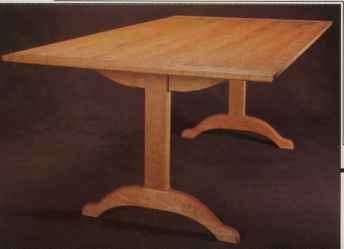 Spare and sturdy, the trestle table shown below is a perfect expression of the Shaker philosophy. With the trestle tucked up under the top, diners could sit close together without having to splay out their knees or legs. The narrow feet at the ends made it easy to sweep the floor under the table. How to build an outdoor trestle tables? 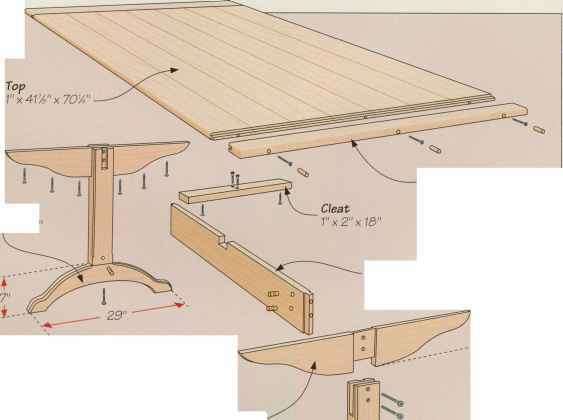 How to build a trestle table? How to make outdoor table? How to make shaker trestle table?